Fast School Fundraising Ideas - Don't Waste Any Time! After-school programs, field trips, renovations, and many other projects are often an afterthought for school administrators and the school board. With such important activities being overlooked in the school's budget, you’re now considering a school fundraiser. These ideas for school fundraising are quick and painless. They’re easy to participate in and you can wrap them up fast. Any grade level can find success with these ideas.And if you choose World's Finest® Chocolate, our system can let you wrap up your fundraiser in just 2-3 weeks! Many of our happy customers choose to supplement their chocolate fundraising with other school fundraising ideas, too. There are pros and cons to each, but overall, they can be effective and raise the team spirit. A pajama day is one of the very easiest fundraisers. Students can pay a small fee to wear pajamas to school. Instead of a pajama day you could have different themes, too: super heroes, movie characters, cartoon characters, retro, etc. One difficult part with a dress-up day is keeping up with which students paid and which ones didn’t. You also have to make sure that students stay in dress code. At the high school level, keeping track of these things may be tough — but it’s still an easy way to raise a little cash. Although this idea may be best suited for younger students, it works for any grade level. Students ask family members if they’d like to donate for every book they read. Dollar amounts can be different for every donor. If your school uses a book testing system with points (such as Renaissance’s “Accelerated Reader” system , donors can pay based on points. Reading for cash is a great school fundraising idea because it gets students motivated to read. It’s competitive and educational. You can ask a local food truck to set up shop outside your school for a day. Have the food vendor agree to donate a percentage of sales to your school’s fundraising cause. This is a big win-win for the food vendor and for the school. Students and teachers would enjoy trying some new food, while the food truck gets some valuable community exposure. You can forge a longer-term relationship with the food vendor and have them come out once a month. In addition to getting a percentage of food sales, you can also ask students to donate a certain collective amount to have the truck set up each month. The most profitable way to sell car decals is to have a local shop supply them. Have the shop agree to donate a percentage of decal sales to your school. The profit margin will probably be higher with a local shop as opposed to ordering them online. Plus, the local shop will be able to create and re-supply them with minimal effort on behalf of the school. Start Selling Premium Chocolate in 3-5 Days! Fundraising for schools is one of the things we do best. Since 1949, we’ve helped organizations like yours across the country raise more than $4 billion (yes, that's billions of dollars, and billions of chocolate bars!). When you contact your local fundraising rep, your premium chocolate bars can arrive in just three to five days after your order is placed. With a $1 or $2 price point, a family recipe using only the finest ingredients, and a variety of decadent options, your chocolate won’t last long! 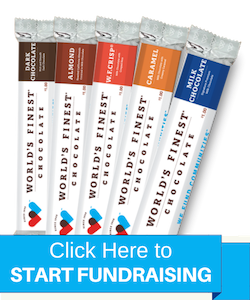 With up to 50% profit margins, your own local rep, custom labels, and quick shipping, World’s Finest Chocolate is an obvious choice for school fundraising. Check out our free fundraising guide and our fundraising calculator!